Placing clients at the heart of all we do will always be our primary goal. Listening to their feedback has led us to expand our service offering to meet their often complex and sophisticated needs, in addition to how we deliver them, always with the aim of going above and beyond what is expected. So when industry recognition comes our way, naturally we are thrilled to be acknowledged. But we also use it a measure of how appealing we are within the marketplace. We hope you will also agree it is a testament to the people within the business who continually strive to create innovative solutions and exceed expectations on a daily basis. Below we share our latest awards news. Hot of the press is the news that we have been shortlisted in two major categories at the upcoming Citywealth Magic Circle Awards 2019. The categories are: ‘Family Office of the Year’ and ‘Trust Company of the Year – Boutique’. We will bring you more on this in future issues. 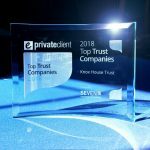 Back in June, our trophy cabinet was enhanced when we were recognised by eprivateclient within their 2018 Top Trust Companies survey. The survey reviews companies across the UK and its Crown Dependencies to determine who the leading fiduciary service providers for private clients across the globe are. A number of areas are surveyed including the size of the business, number of client facing directors, M&A activity along with the extent of the global offering. Most recently we were praised for our specialist Marine and Aviation services, with the award for “Best Aircraft and yacht Corporate Services Provider 2019” by World Commerce Review for the third year running. WCR advised their readers that we had been honoured by them once again for our continued diligence and excellence in this field. Their awards programme celebrates achievement, innovation and excellence across a variety of markets and industry sectors. Now in their eighth year, the awards were established to highlight the excellence of advisers and managers in the private wealth sector in the major financial centres. The winners will be announced at a prestigious ceremony in London on the 23rd January, following an in-depth judging process which includes an online open vote for clients and industry peers. Winners will be those recognised for their success in achievement, innovation, expertise and service. If you would like to show your support for us at these awards, you can cast a vote here before the 1st December and simply tick the relevant voting buttons. Your support is greatly appreciated. Keep up-to-date here with all our latest awards news.